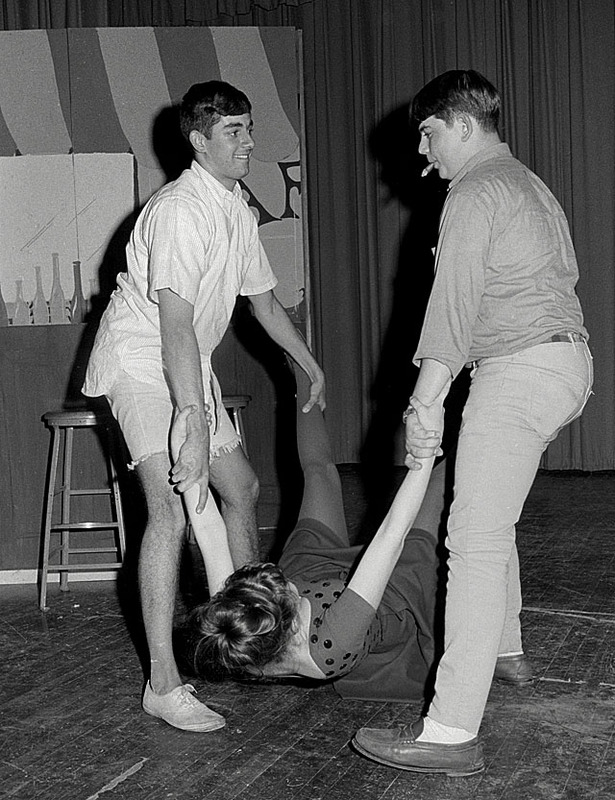 One of my photos illustrated a an April 7, 1967, Margaret Randol feature on “Bye, Bye, Birdie” on The Missourian’s Youth Page. 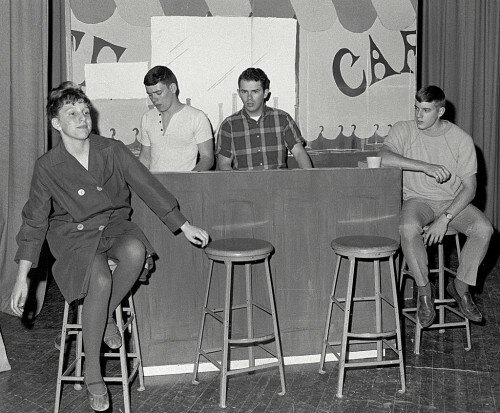 The caption read, Bruce Huebel, Gary Sides, Richard Harter and Charles Holt, who are playing Shriners in Central’s “Bye, Bye, Birdie,” look up in confusion at Rosie (Miss Barbara Nunnelly), who broke into their meeting room and started dancing on their table. Bruce is the son of Mr. and Mrs. Harry Huebel, 1109 North Main; Gary is the son of Mr. and Mrs. W.E. Side, Jr., 221 East Cape Rock Drive; Richard is the son of Mr. and Mrs. Austin G. Harter, 2526 Jonquil; Charles is the son of Mr. and Mrs. Grant T. Holt, 1835 Lacey, and Miss Nunnelly is the daughter of Dr. and Mrs. Gordon M. Nunnelly, 1432 Themis. Like any other delicacy you would prepare, a successful and appealing “Birdie” begins with the fixin’s. Blend these ingredients for three months and add the support of the whole school to make the spirits rise. Place this combination in a large, well-filled auditorium and serve. The directors, Mrs. Judy Williams, Mrs. Madeline DeJournett, and Bill Ewing, along with 70 members of the “Birdie” cast, have sacrificed leisure and work time – plus hours of sleep – to make “Bye, Bye, Birdie” the must successful musical ever produced at Central High School. The rehearsals have been far from uneventful, testifies Miss June Siemers, daughter of Mr. and Mrs. Wm. R. Siemers, 1635 Brookwood. She said she was supposed to run the length of the stage into the arms of her waiting partner. The running went fine, she explained. The flying through the air part was all right…it was when she missed her waiting (??) partner’s arms and landed on the opposite end of the stage that presented the difficulty, Miss Siemers related. I was wondering if you had any of these photos! I do not have a single picture from that play–after three months of unbelievably difficult work, practicing every afternoon after school and every night! In fact, my husband and I had been married only 4 years at the time, and this play very nearly destroyed our marriage! No kidding–he was NOT supportive! Judy’s husband, on the other hand, was a jewel! I’m sorry you have no photos of the Siemers girl, because she was extremely talented. We did two performances, and the Seimers and Nunnelly girls had the lead–one each night. During tryouts, we couldn’t decide between them, so we chose both. It worked out well, since the audiences wanted to see both girls in the lead. We had a choreographer whose name eludes me. It was Central’s first musical, produced the year after Notre Dame’s first musical–The Sound of Music. Big pressure to keep up with the Joneses! Thanks for the memories, Ken! I couldn’t resist posting this when I saw you were the director. There’s always a chance there are more photos hiding somewhere. These were some that I had scanned a long time ago. I just happened to stumble across Margaret’s story while looking for something else, which prompted me to dust them off. I’m pretty sure I have the Sound of Music kicking around. Did you have a piece of these Red Dagger plays or were they before your time? OMG!! The photos made me LOL and my kids are going to have a big laugh when I forward the link! It was Vicki Boren who was the other “Rosie” and my younger brother Bruce played the little brother! I had played flute for the Notre Dame musical the year before as they did not have enough musicians for an orchestra. It was definitely this experience and the wonderful encouragement of Judy Williams, Bill Ewing and Madeline DeJournett who fed my passion to finally end up in NYC and working for a variety of arts organizations. One of my offices was actually on the real Broadway and I even got to “appear” several times as a keynote speak at Carnegie Hall! I have more photos of the musical somewhere. It was definitely the highlight of my Central experience. Vicki Boren went on to have a distinguished career as a music teacher and brother Bruce still plays saxophone and flute. . . Even appearing last weekend and this coming at River Ridge Winery! And let’s not forget that Rusty Limbaugh appeared in the male chorus!!! Thanks, Ken! PS. the amazing choreography was done by a fellow student Chris who had actually studied at Martha Graham! Steve Jones is on the left side of the second and third photos. In the fourth photo, Steve Cobb is on the far left, with Eugene Frazier next to him. They are both also in the next picture. I wasn’t in the production, but fondly remember seeing it. Thanks for all the wonderful memories that you’ve kept all these years and are now sharing with us. I look forward to this each day! PPS After consulting with Marge Nunnelly (my Mom!) I found out that it was Chris Stevens who choreographed Bye Bye Birdie as a senior. Her Dad had taught at Culver Military Academy and they had recently moved to Cape. She had, indeed, studied modern dance at Martha Graham!! We actually did three performances with me doing two and Vicki Boren doing one. The late Don Evitts was the other male lead and my prom date that year! Oh–I lost the thread of this topic! Vicki Boren–that sounds more like it, and I did remember the choreographer’s name was Chris. No, Ken, I came on board with the Red Dagger Club the same year that we did “Birdie.” It was my first year at Central. Dallas Albers hired me; he asked what extra-curricular activity I would like to sponsor, and I said drama, which shocked him very much. They were planning a musical at that time. We used the Red Dagger activity fund of $600.00 to finance the play, if I remember correctly. Not many Red Dagger members were in “Birdie,” as it required singers. I’m sorry to hear about Don Evitts. He was a dynamic, funny young man and a joy to work with! It has been awhile since the plaque was last seen, but in December of 1967 Chris Stevens’ stunning performance at the returning freshman Christmas party lead to the inauguration of the “Find of the Holidays” award. It ran for another 10 or so years. Sorry to hear of Don’s passing, Steve Hileman is also deceased. I believe the far right in the bar scene is Gary Heuer (sp?). I do remember Mrs. DeJournett being pretty emotional in English class one day during production, she left the room crying, Bev Hayes got us all to chip in and buy her roses. She was a great teacher, didn’t try to suppress her students personalities. Betty Seabaugh played my wife (I was the Mayor of Sweet Apple ,Ohio ) when Conrad began to sing after I gave him the key to the city, she swooned. What great memories! I played a very insignificant part in the play but what fun. Does anybody have a picture of Steve Hileman as Conrad. So sorry to hear of his passing, I missed our last 2 reunions. Hi Van and Barb. Certainly playing the lead in Birdie with Barbra was a high-light of my HS career! We had a great time! But, my grandma was shocked by the Shriners number! Of course, that was my favorite part. Getting thrown around on stage by those cute guys! I LOVED it!! I went on to direct Bye Bye Birdie 3 times in my 30 years of teaching! It was by far, my favorite show! I was an insignificant cast member, too. My singing capabilities were much greater than my acting or dancing skills. It was a great time and thanks for those memories and pictures of cast. Are any of you going to the 2018 production of Birdie?? I’m pretty sure that once in my lifetime was enough. No, no, it isn’t! Tell me, did you come see in in 1967??? I can’t really remember. I doubt it. Since I had already seen it at rehearsal (and had made my money for shooting it), I probably skipped it. I never liked to plow the same ground again. But, I bet it was REALLY good. Hello to all my “Tiger” friends. What a rush to be in the first musical that Cape Central produced. Not only was I a Shriner, but also was chosen to sing the Harvey Johnson solo during the “ teen telephone” scene in the first act. Wouldn’t it be fun to get a group from the original cast to attend this year’s production?! As teens in the production, we were suppose to wear bright clothes to distinguish us from “the grown ups.” I wore an orange paisley shirt with lime green shorts! OMG…now I am embarrassed.